The Guyana Defence Force (GDF) has begun moving troops closer to the Guyana-Venezuela border amid reports of heavily armed Venezuelan ‘Sindicato’ gangs and curb the smuggling of illegal guns for food, officials said. Minister of State, Joseph Harmon said Guyana was aware of violent incidents, including the beheading of persons, by Sindicatos. “We have had several reports in that area of Venezuelans crossing, we have had reports of Venezuelan civilians crossing over so there are a lot of activities in that area and we have taken note of it and certainly our presence will be much more and much regular than it is right now,” Harmon told Demerara Waves Online News. The Ministry of the Presidency reported on Saturday that a new GDF patrol base was established on February 14 after the Regional Intelligence Committee reported to President David Granger some security concerns as a result of the current situation in Venezuela. “These reports were acted upon swiftly by the Government and the base was set up in less than 72 hours,” the Ministry of the Presidency said. “We want to make sure that you are safe and I’m here because I’m concerned about your safety. I’m here because I don’t want anybody to attack you; I don’t want anybody to hurt you; I don’t want crimes to be committed against you,” he said. The military presence is intended to neutralise any illegal activity and provide a 24 hour guard system to ensure maximum security,” the President said. He also urged residents to create Community Policing Groups (CPGs). “The police and the army cannot be everywhere. We want you to be able to protect your own community so… I’ll ask the Chairman [Regional Chairman] to sit down with the army, the police and the Toshao so that we can decide on how best we can help you to protect yourself… Every Guyanese must feel safe in his or her own country,” the President said. Regional Chairman of Region One (Barima-Waini), Brentnol Ashley told Demerara Waves Online News that there have been unofficial reports of guns being smuggled to Guyana in exchange for food which is very scarce in Venezuela. Ashley said the Regional Intelligence Committee informed the President about crimes being perpetrated on Guyanese living and working near the border. “Our Guyanese brothers and sisters who live in the reach of Venezuela were being harassed, abused,” he said. The Regional Chairman, however, said he would be consulting with residents about more police and soldiers in the communities because of historical concerns about unprofessional conduct. “While we will be happy to see the presence of more security within our communities to protect us, there is still a question of these officers when they go to these communities to remain within the professional framework of executing their duties because we get a lot of complaints coming out from these communities about policemen or GDF representatives even be the persons who are harassing or abusing persons,” he said. He said residents have spotted Sindicato gang members moving around in Guyana. “They would also reported to us that they would have seen traversing in some of these communities like White Water, even at Kumaka, some of these very gang members from the Sindicato so it’s out of these concerns that we would have written the President on the matter, seeking to have additional patrols done by the Joint Services,” he said. Another area of concern, he said, has been an increase in theft and altercations by Venezuelans who have entered Guyana in search of better conditions. 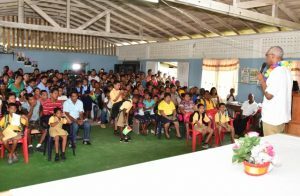 “In addition to the Guyanese who were living there, there are Venezuelans who are coming to the region and we would have found that in Kumaka- that is the business centre- there has been an increase in petty crimes such as break and entry and even sometimes causing disorderly behaviour in the community,” he said. The Regional Chairman said it was also recommended that the police be provided with vehicles to patrol White Water, Mora Landing and other areas because they are very far from the administrative centre of Mabaruma. Concerns have also been raised about the absence of Port Health Authority officials to monitor the importation of vegetables, poultry and cattle from neighbouring Venezuela.